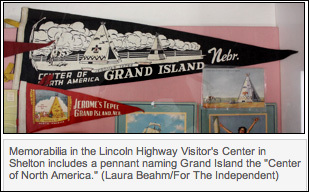 The Grand Island Independent ran a nice follow-up to the Lincoln Highway Festival in Shelton, Nebraska, including a walk through of the LH Visitor’s Center there. Following are some parts of their story. 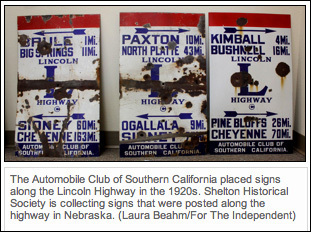 But now as the 80-year-old Nebraska president of the Lincoln Highway Association, Stubblefield is doing more than watching the highway and its traffic — he’s helping preserve the history of its creation. He helped create the Lincoln Highway Visitor’s Center located at C Street and Highway 30 in Shelton and shares time staffing that center with other volunteers of the Shelton Historical Society. All are just a cell phone away to greet visitors and open the center’s doors at the back of the historic First State Bank building…. Once inside, it’s everything Lincoln Highway. Pens, postcards, water, letter openers, ashtrays. There’s Lincoln Highway cigars — just 9 cents in the day — and of course, there’s Burma Shave memorabilia. It was right by the big Husker Harvest Days billboard located at Highway 30 and Husker Highway, Stubblefield said, on the north side of the road. “It was what was called a tourist trap,” he chuckled. One of the most stunning displays in the visitor’s center is a row of original metal Lincoln Highway mileage markers. They were purchased by the Automobile Club of Southern California and erected along the highway to give travelers an idea of distance to the next stops. Stubblefield and other members of the association (there are 100 in Nebraska and 1,100 nationwide) have purchased the signs at auctions, antique stores or wherever they are found. This entry was posted on August 11, 2010 at 4:33 pm and is filed under highways, history, Lincoln Highway, museum, travel. You can follow any responses to this entry through the RSS 2.0 feed. You can leave a response, or trackback from your own site. hi, brian, it would be nice if the links on your posts’s pix were to the original hi-res images instead of the same lo-res that’s already displayed. Tom, I posted the lo-res versions for a few reasons. First, I prefer not to take and use other people’s hi-res images if I don’t have to — I don’t like when people do it to mine, and in linking directly the credit would be lost. That brings up the second reason: note that I included not just the image but the caption and credit. THIS IS ON PURPOSE so the credit is included. Finally, this is a spare time hobby offered for free, not a news service, so there will be times when readers might have to make a couple more clicks to get exactly what they want. Tom, I do not link to their photo; I don’t even link to mine. When I post a photo a link is automatically created to where the blog puts my image. Yes I could do more but I’d rather spend time posting more info, which I already struggle with as this is a spare time HOBBY not a staffed news organization.